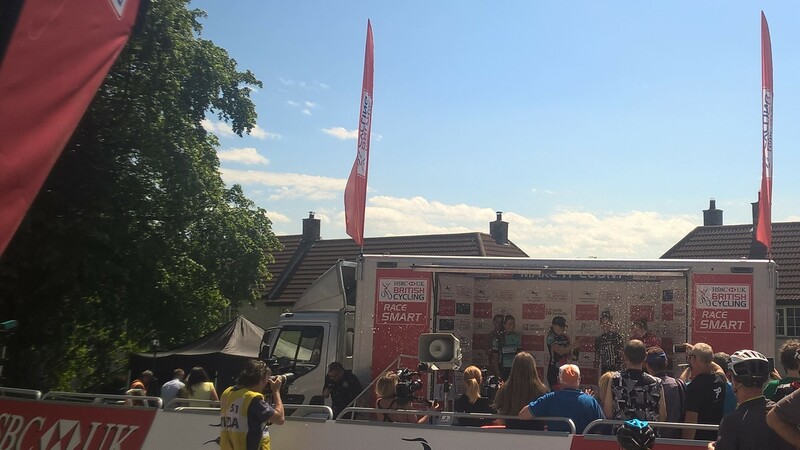 I’ve taken part in the sportive for the last few years and have always intended to head out to Stamdfordham to watch the pros without ever managing to get there. This year the weather was perfect and I wasn’t too tired after my Saturday effort so there was no excuse for missing the races. 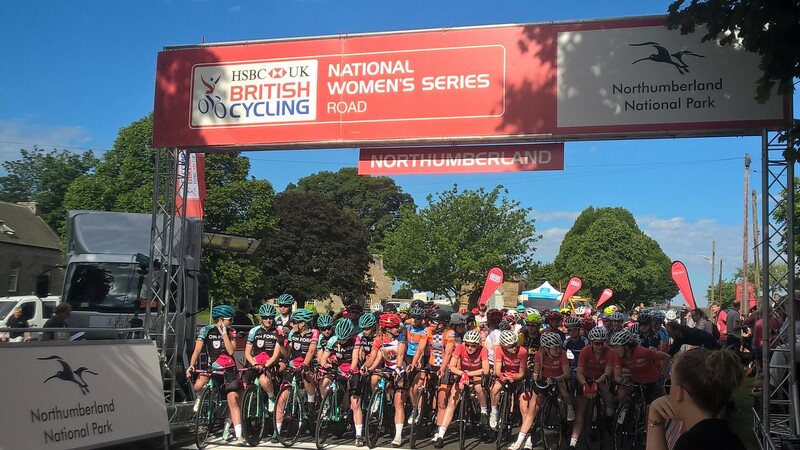 The Curlew Cup, part of the Women’s National Road Series, was the first race of the day with roll out at 9am which meant a 7:45am start for the hour ride out to watch. I got there in plenty of time to see the riders gathering in the centre of Stamfordham, ready for the start. Once the riders set off for the neutralised start I, and almost everyone else who had been watching, headed west to the climbs of the Ryals. The roads are usually very quiet around Ryal but today saw a long convoy of riders supports and families heading along the narrow lanes, held up behind me and another rider as we’d got away first thanks to not having to get to a car first. It was all very friendly and the convoy re-arranged itself around people on bikes as passing places allowed. Even though it was still early it was very hot and I was glad to have smothered myself in sun cream before leaving the house. I whiled away the next 45 minutes or so chatting to other people who had turned up to watch at the steepest point of the climbs. One person had cycled from Rothbury that morning and there was someone from Bingfield, the next village along. As the time the race should be due got closer more people who had already watched it pass the norther point on the circuit arrived after cutting through the back roads. It was possible to see the race convoy in the distance just after it passed through Hallington so there was plenty of warning of the riders arriving. The race was altogether with strong showing from Drops, WNT, OnForm and Story Racing making light work of the steepest part of the climb and leading the bunch up. I toyed with the idea on riding up to the northern part of the circuit to see the race twice on the next lap but didn’t feel that I’d be fast enough so stayed where I was. 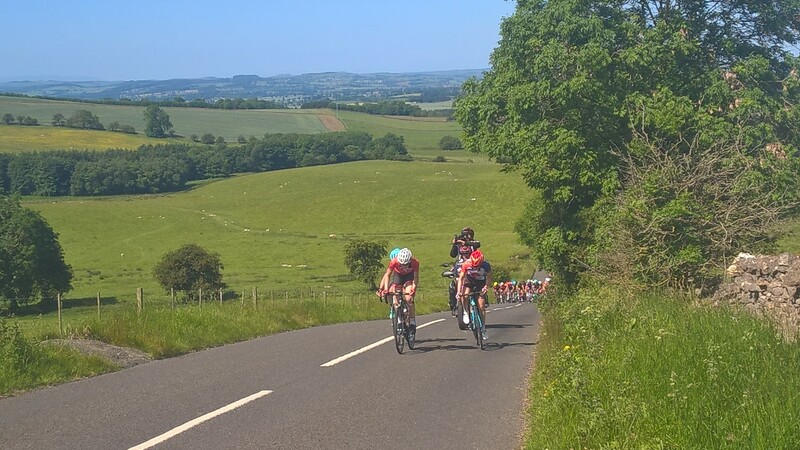 On the second lap there was a three woman breakaway (afterwards identified as Annasley Park of Drops, Melissa Lowther of Breeze and Beth Crumpton of Story Racing). Annasley Park, Melissa Lowther and Beth Crumpton climbing the Ryals for the second time. Once the race passed I rode back up the second Ryal (the easier one) passed lots of spectators at the official QoM line and went back to Stamfordham to catch the finish. Back in Stamforham I met some friends who had also come out to watch the races so we found a shady spot to wait for the riders to arrive. An unsurprisingly fast finish saw Julie Erskine from onForm take the win followed by Hannah Payton from Drops and Georgina Panchaud from Bianchi. Katie Archibald won both the QoM and Points. Georgina Panchaud (3rd), Julie Erskine (1st) and Hannah Payton (2nd) on the podium. I had intended to go home after the women’s race but decided to stick around to ‘help the local economy’ and stop for beer and ice cream with my friends. 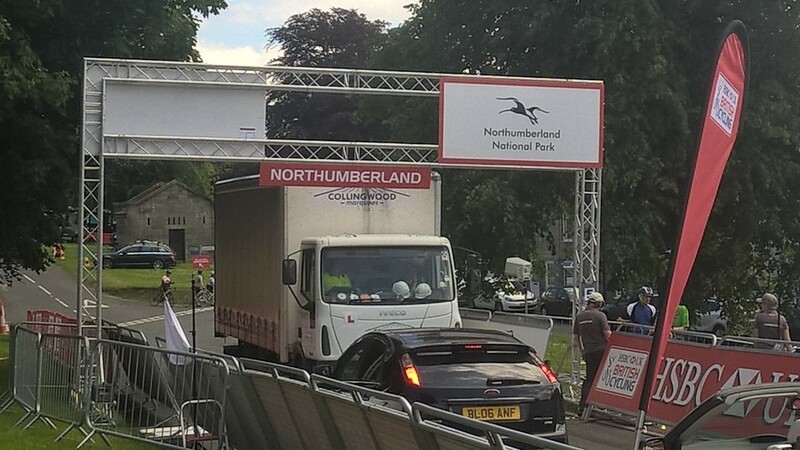 If I hadn’t have stopped I’d have missed the main drama of the day – a lorry almost driving in to the start/finish gantry shortly after the start of the men’s race. Luckily a motorist coming the other way was blocking the road and beeped at the lorry driver who stopped just in time. I eventually headed home, back along the route of the last section of the previous day’s sportive beating a few of my segment times from the previous day in the process. I guess that’s the difference between having ridden 90km and having sat around for most of the day!